The land in Mount Merrion is in a residential part of south Dublin. TWO GREENFIELD SITES on the north and south sides of Dublin that have been given the thumbs up for residential development have been put on sale for a combined €28 million. 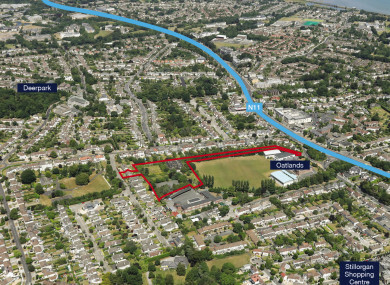 One of the sites on the grounds of Oatlands College in Mount Merrion in south Dublin has planning permission for 63 homes and is being put on sale with offers beginning at €13 million. The other site is located in north county Dublin on the grounds of Kinsealy House near Portmarnock and has planning permission for 100 new homes. This site is being brought to market with offers beginning at €15 million. The sites are being sold separately by estate agent firm Savills on behalf of property development group Marlet. John Swarbrigg of Savills said today that the sites are expected to “generate a significant interest from national and international developers”. The planning permission for the Mount Merrion site consists of 63 residential units in total. Among these homes are nine houses with three to five bedrooms, 24 duplexes of two to three bedrooms and 31 apartments. The 16.06 acre site in north Dublin. The land is Kinsealy is 16.06 acres in size and the planning permission for the homes in the site is mainly three and four-bedroomed semi-detached houses. The land is on the grounds of Kinsealy House and the planning permission also includes refurbishment of that building. Email “Two green sites on either side of Dublin are going on sale for a combined €28m”. Feedback on “Two green sites on either side of Dublin are going on sale for a combined €28m”.